Sunday is the quietest day in the week for me because everybody is working. Anyway, yesterday, my DEAREST sister was having fun making fun of me by sending me this photo. 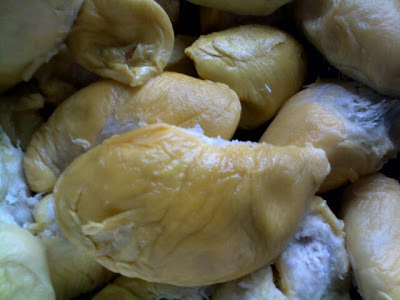 @#$@$%$^ Everybody knows I love durian! and I cant get it here in Perth. Such a nice sister isn't she. She did try her best to send me some durian afterall! Since I got no durian. I decided to have some packet cheesecake that I bought from Korean shop in the city yesterday. Well, it's yellow anyway.. similar to durian.. -_- lying to myself. I have such a sad life isn't it. Anyway, I love fluffy cheesecake. So I thought I can give this a try. Fortunately enough, this cheesecake tasted good. I think it's not cheesey but the texture is nice. Too bad it's such a small piece. Where got enough right!?!? So small. No choice lar~~~ no REAL DURIAN!